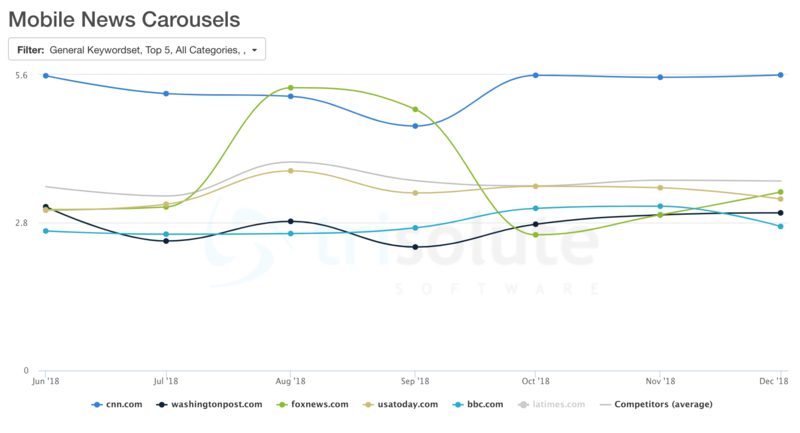 CNN has established itself as the dominant publisher in Google news-related visibility in recent months. In this analysis from the News Dashboard, we’ll dive deeper into their performance in the mobile News Carousel and desktop News Box on the Google SERPs as well as Google News in October 2018. We’ll also consider the publishers who round out the Top 5 most visible list in each ranking type. The News Dashboard is an analytics and SEO tool that looks specifically at Google search visibility. All of the Google News categories – U.S., World, Local, Business, Technology, Entertainment, Sports, Science and Health – are considered in this analysis. An example of a mobile News Carousel on the Google SERP. The mobile News Carousel is part of the News Boxes on the Google SERPs. The carousel is made up of article “tiles,” which generally consist of a picture and the article headline. The carousel scrolls horizontally, and usually has at least 3 and sometimes more than 10 positions. This report is one of 12 that publishers can view the KPI Dashboard in the News Dashboard. For October 2018, CNN was the most visible publisher in this ranking type, with a visibility of 5.59 percent. This comes after a Position 2 for visibility in September, after Fox News. 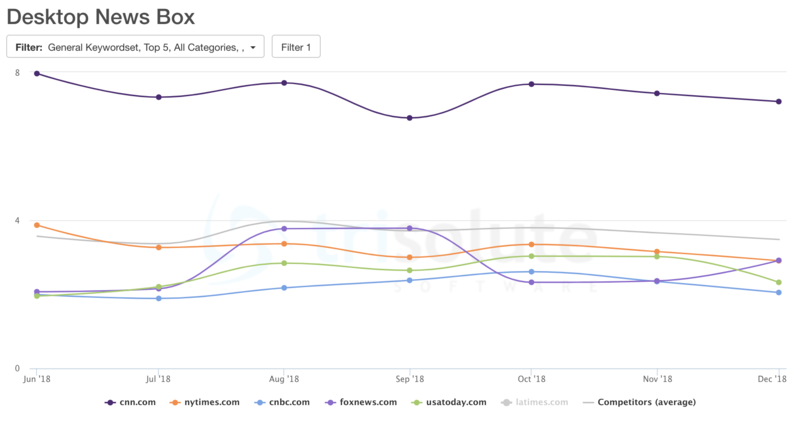 The Top 5 publishers that ranked in the Mobile News Carousel are below, along with the specific keyword they were most visible for. Politics keywords ruled the day for this ranking type. 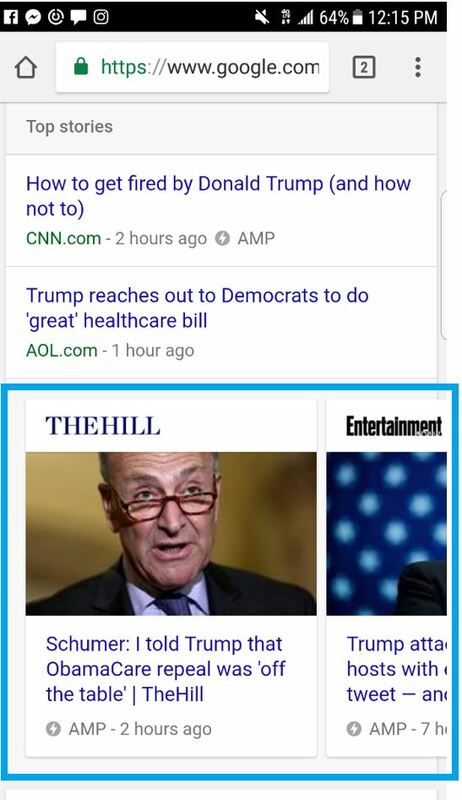 Looking at Google News, CNN continues to hold its place in Position 1 for visibility. YouTube has continued earning growth in visibility, jumping to Position 2 in October. Of course, YouTube is not a news content publisher itself, and is instead a video platform used by news publishers. With the News Dashboard, you can reveal the publisher connected to each video URL that ranks. In Positions 4 and 5, we see USA Today and the New York Times have consistently swapped positions for visibility in Google News. CNN had its largest margin from the nearest publisher in desktop News Box visibility for October. Much like in mobile News Carousels, Fox News had a two-month bump in visibility followed by an evening out of the visibility line. Generally, we see that the Top 5 publishers have remained steady in desktop News Box visibility over time. Overall, CNN has maintained its position as a high-ranking publisher in visibility. 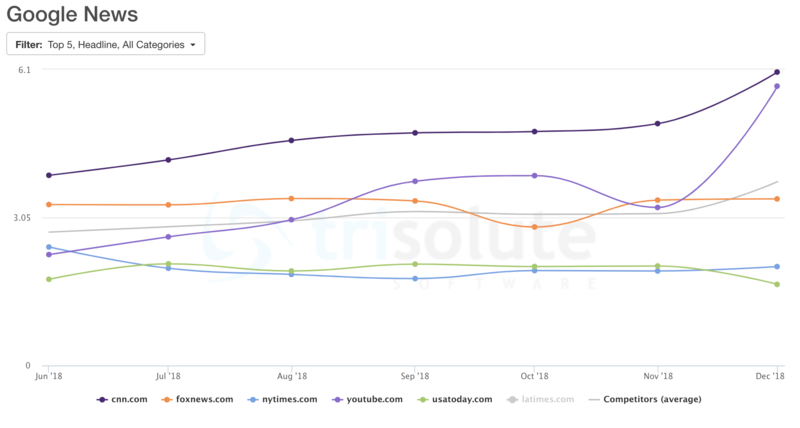 YouTube, which has increased its visibility wildly since the Google News redesign in mid-2018, continued its rise. Are you interested in learning more about how the News Dashboard can help your newsroom’s articles perform better in Google? Find out more about how you can gain access here.